Deciduous forests, especially along borders, trails, and clearings; on shores and bluffs; dune thickets and rocky sites. Eurasian plants differ slightly from our native American ones, which are var. americana (A. Gray) Fernald & I. M. Johnst., also known as H. americana (A. Gray) Fernald. Plants with leaves as wide (very rarely) as 5 cm are robust ones (a meter or more tall), while plants of H. virginiana with leaves as narrow as 2.5 cm are small, delicate ones. 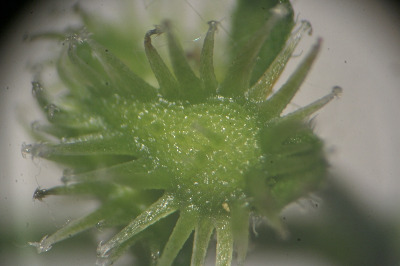 The difference in flower color is consistent on Michigan material, although as in any blue-flowered species white-flowered individuals of H. deflexa might occur. MICHIGAN FLORA ONLINE. A. A. Reznicek, E. G. Voss, & B. S. Walters. February 2011. University of Michigan. Web. April 20, 2019. https://michiganflora.net/species.aspx?id=571.